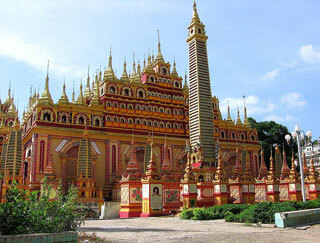 Monywa is famous for its buddhist temples like Thanboddhay Pagoda , a Buddhist temple with a huge stupa resembling Indonesia's Borobudur. It dates from 1303, although it was reconstructed in 1939. It is said to contain over 500,000 images of Buddha. Close by is the Maha Bodhi Tahtaung Laykyun Sekkya standing Buddha statue, the tallest statue in the world, with 115,82 metres (at a total of 129.23 metres, including pedestal). This is the focal point of a sprawling site filled with Buddha statues, bodhi trees, and pagodas, established by the Maha Bodhi Ta Htaung Sayadaw in the 1960s. It includes also a 95-metre long reclining Buddha statue. This article uses material from the Wikipedia article "Monywa", which is released under the Creative Commons Attribution-Share-Alike 3.0 License.